Use the Risk Parameters window to view markets and risk limits that are setup for the user (TT Username) that is logged in to X_TRADER®. Note: All risk parameters are configured in TT User Setup and cannot be added or modified using this window in X_TRADER. To open the Risk Parameters window, select Settings from the X_TRADER Control Panel and click the Risk Parameters menu item. 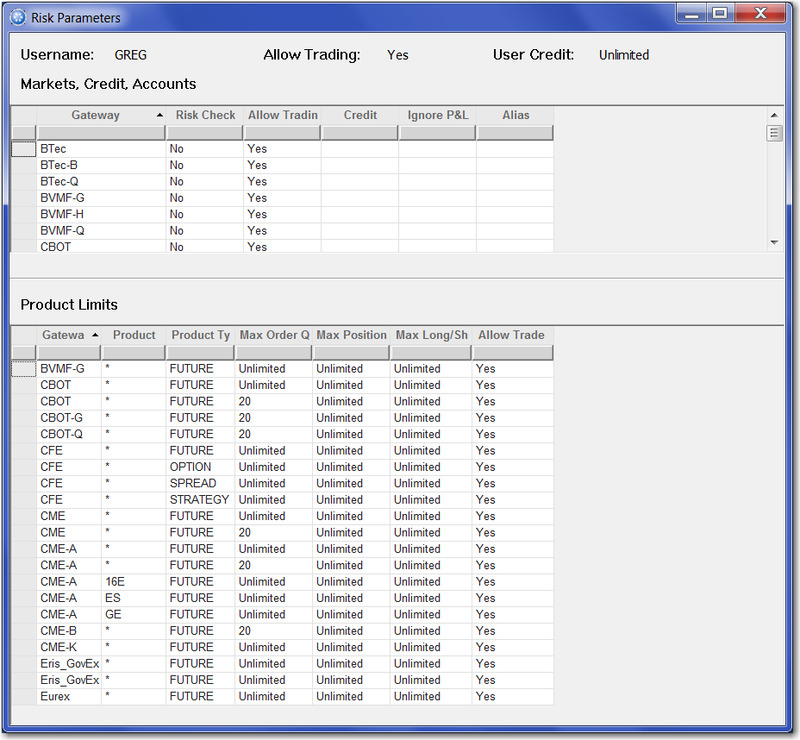 The User Information (top row) displays the TT Username that is logged in to X_TRADER, whether trading is allowed for this user, and the credit limit and currency set up for the user (“Unlimited “is displayed if no credit limit is declared in TT User Setup). The Market, Credit, Accounts Grid displays risk checking parameters for each TT Gateway available to the user as determined in TT User Setup. The following columns are included. The name of the Broker that has created the Gateway Login. The Product Limits Grid displays product limits for each gateway login that is mapped to the user in TT User Setup, and includes the following columns.